Born in Kentucky, Oliver Yantis was a cotton farmer near Orlando, Oklahoma. 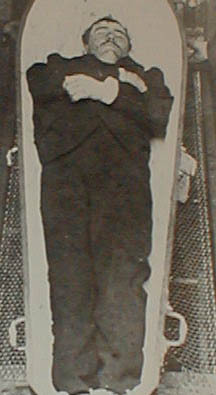 Yantis became a member of Bill Doolin's gang by request of Bitter Creek Newcomb. It was rumored that Newcomb had a thing for Yantis' sister. Oliver was with the Doolin-Dalton gang when they robbed a train in Caney, Oklahoma on October 14, 1892 and a bank in Spearville, Kansas on November 1, 1892. Oliver Yantis was shot by lawmen at his sisters ranch south of Orlando, Oklahoma. 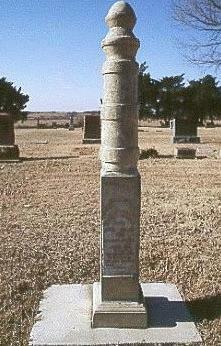 He is buried in the Rose Lawn Cemetery south of Mulhall, Oklahoma. This morning Oliver Yantis, a desperado, was shot by United States marshals near Orlando. He is one of the three men who robbed a bank at Spearville, Kansas, and is also suspicioned of being one of the train robbers at Wharton. His mother keeps the Commerce hotel, at Stillwater. Some of the banks money that was robbed was found on his person. A detective, sheriff of Ford county, Kans., and Tom Huston, marshal of Stillwater surrounded his sisters house last night, and this morning when he came out of the house was told to hold up. As he did so he lifted a revolver in the air and shot. In return he received two shots, one in the leg and one in the stomach. He is at Orlando, and is not expected to live. This is a work in progress, so please contact me if you have any information that might help. Click here for the transcript of William Yantis 74 (great nephew of Oliver Yantis) dated 3-20-2002.